“…in combination with a pro-independence majority in Holyrood, a terminally weak Scottish Labour Party, and a British ruling class in crisis means that there may not be a better opportunity than in these next few years to seize the initiative”...argues Jonathon Shafi ahead of tomorrows Reassemably in Glasgow and October’s RIC conference. Alex Salmond has said in an interview that he expects a referendum in 2018. That’s an important statement. It stokes the discussion around making a second referendum something concrete. It provokes debate about coming to a definite line of march towards independence. We may expect fairly rapid movement in this direction when Article 50 is triggered. The Yes movement has a huge latent potential in terms of activism, roots, organisation and ideas. Whatever your party political persuasion, the grassroots movement that developed in 2014 has kept the question alive in various ways. As have events. The re-election of the Tories and Brexit – the ‘material change’ that would trigger a new referendum – have come to pass. This in combination with a pro-independence majority in Holyrood, a terminally weak Scottish Labour Party, and a British ruling class in crisis means that there may not be a better opportunity than in these next few years to seize the initiative. There is also no doubt that pro-independence opinion while it has hardened (as shown by consistent opinion polling data) has also to some extent dulled. That’s entirely natural, especially if you got involved in politics for the first time in the heat of 2014 and have not voted since, or been active politically. Speaking with friends in this bracket recently, the belief in independence had not reduced, but they didn’t feel connected to it in the same way – and certainly did not feel like they were part of a ‘movement’. Most of us will know people who are feeling like this. But independence remains the key and overarching strategic interest in Scottish politics. It is the only factor that makes political work in Scotland relevant to the international scene. It provides us with the possibility of coming to a big picture vision from the left – which can result in the emergence of strategy in relation to real social forces and force reactions from those in power. It is easy to forget what was achieved in 2014 – and at the same time it’s not good enough to say ‘let’s do the same again.’ We need a balanced view that considers the new situation we are in. A chance to dismantle the British state at its moment of acute crisis is coming into view – maybe more quickly than we expected. The terrain will be different – and more challenging in many respects. The vision and impulse of 2014 may return if alternatives to the failure of the British economic and social model are energised. A lot of work needs done on that front. For sure – a social alternative to the UK model is needed to motivate a genuinely mass movement. Internationalism built from below can connect the movement to other forces involved in what in essence is a struggle for democracy and against neoliberalism and war. What about the developments on the progressive left in England? The right preparation now is vital. That is why RIC has called a special conference next month. To reflect the changes that have taken place politically the conference will have more involvement from the English left with Momentum activists speaking. There will be debate on Corbyn, Class and Independence. There will also be debate on the EU, neoliberalism and the changing context in which a future referendum takes place. There will be a workshop stream dissecting the the anatomy of British decline covering the economy, foreign policy, the media, democracy and corruption. And there will be a venue dedicated to practical work on anti-racism and building in communities and workplaces. The event will be an arena of discussion and look to embrace debate in the independence movement by opening up conversations on strategy and vision. It’s very much the start of that discussion to build up to being in a position to display a coherent left-wing campaign in the years ahead. Speakers include activists, academics, MPs, commentators, campaigning organisations, think tanks and trade unionists – to name a few. It is a real coming together of everything you would expect from a RIC gathering. But we have gone the extra mile to make this event more than a reconvention. 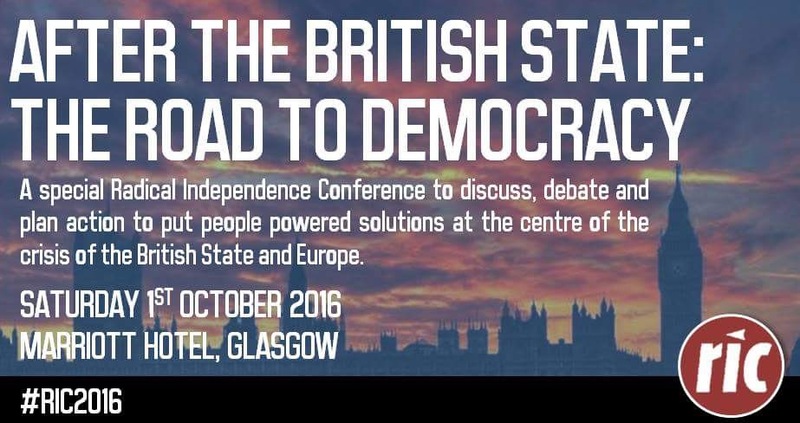 Titled, After the British State: The Road To Democracy, we will hear from struggles taking place internationally as we discuss, debate and plan action to put people powered solutions at the centre of the crisis of the British state and Europe. We will hear from French anti-racist activists, from the Catalonian radical left, from the repeal the 8th movement in Ireland and from people who have been at the sharp end of racism and neoliberalism. And we will go further than Europe. We will hear from the recent mass strike of 150 million workers in India – we’ve even got a special documentary film being made from the North Dakota Pipeline protests. It’s about raising our sights, and being part of a global movement. It’s about welcoming back those people who have not been active for the past couple of years and reaching out to new layers – including many who will want to raise challenging questions. Alex Salmond has moved the situation forward in speculating about a referendum sooner rather than later. But regardless of that we need to get prepared for all eventualities – and there is so much work to be done. So much for you to be involved in helping with. Join us on October 1st. You will leave feeling inspired, with a clearer idea of what may lie ahead and with new networks which you can be involved in. RISE got fewer votes than the Scottish Christian Party, whoever they are, so I doubt there is much room on the left at the moment. Corbyn-transformed Labour will test that. But I don’t see a second referendum under Sturgeon – too cautious – so not for the next five years, her political lifetime. And more likely it will take a good while after rEU moves into a new equilibrium and we know what the terms of trade outside are before are before a referendum is winnable. The focus should be on institution building rather than retail politics which are dated by the time they reach the shelf. You make the mistake of assuming the current SNP leader decides. Theresa May triggering article 50 will decide. The Greens and tbe SNP will push for the next independence referendum when the time is right regardless who is current leader. It does not matter if their is a pro independence majority in Holyrood as Wee Nicola is paralysed in the headlights of polls which show no movement in public support. The fact that her personal ratings have fallen below two Tory leaders speaks volumes for how fed up people are with the posturing which they know is going nowhere. The damage to business confidence and the bungling of public finances are becoming everyday topics across the media. If such a majority was to have any effect then promises made by Wee Nicola would have to be broken and the people of Scotland would not stand for this. Salmond has been trying to stoke support in the face of repeated polls which show no change from 2014. As the half year results start to come in business organisations will put more pressure on her to abandon this mendacious attempt to deny the democratic will of the majority of the people of Scotland. Quoting the Ruth Davidson poll knowing it is a flawed poll saved me having to read the rest of your comments. Conflating Scottish Independence with extreme socialism will ensure the continuation of the Union. You are absolutely spot on but watch out for the abuse. Abuse already has come two posts ago. The polls tell the story! People are fed up and do not believe her when she says she has a mandate! I know you people don’t like facts and think that the majority who want neither a further referendum or to be separated from the UK should be disregarded but democracy is democracy. How can the UK be seen as democratic when the largest country in the UK outvotes each of the other countries by at least 10 to 1. That is why independence for Scotland is inevitable. 50% of the Scottish population voted SNP at the last Scottish election. We like democracy too. The Troll bait appears to be most effective. Debate on this site is not being stifled, it’s being misled, misinformed and manipulated by unionist trolls. Bella you need to get a grip of this other wise it will kill the reputation of the site and visitors with something positive to contribute will disappear. Sounds very much to me that debate is only to be allowed if you express support for independence. The only misleading contributions providing misinformation on here are those which continually assert that there is some kind of mandate given by the Brexit bite and that a majority of the people of Scotland favour a further referendum or independence. There is no majority in favour of either of these. Of that I am positive! Indeed! ‘High time they were sent back to the fetid swamp of ‘The Hootsmon”s comment strings which is their natural habitat. Graeme that seems a bit harsh to me – freedom of speech and all that! I agree with this. The left of of the Yes movement was by far the most credible because they actually had a principled agenda other than nationalism. Are you saying that the far left although supporting Yes and voted Yes did not support independence? At the risk of putting words in their mouths, I think most socialists and anarchists don’t favour nationalism, Scottish or British. Nation states are a bourgeois invention, and they think the natural level of government is either larger or smaller. I think they are all social constructs and the nation state is the largest practical level – as the EU experience shows. What we are witnessing is a handful of people who voted NO in 2014 popping up on this site and putting forward arguments based on facts, evidence and logic which the YES voters are unable to counter other than by launching into a hatefest directed at Westminster, Tories, mainstream media etc, etc. It was only a matter of time before someone proposed the classic left wing tactic of clamping down on dissenting voices. As dear old Corporal Jones used to say ” they don’t like it up ’em!”. Ever get the feeling you are losing an argument? The comments on ‘Scot goes Pop’ are unreadable due to trolls. The British State knows they lost the online battle last time. It looks like they are putting in more effort this time. I suspect that many of the regulars on here believe that myself and Doubting Thomas are M15 agents. The 77th Brigade was set up to work on social media. When they start hanging blow up dolls from the rafters it will be time to leave. The independent state of Govanhill is open to all. Very socially progressive all sleeping together in one room but loads of benefits. Mr and Mrs Sturgeon see to that. Not a site I am familiar with. “The British State” …….dearie dearie me!!! Naw son…….just an old Scotsman who favours the democratic process and who is about to pay more tax than other citizens of the U.K. The absolute lie for not increasing the higher rate tax band in line with the rest of the U.K. was that it was to pay for free bus passes, free prescriptions and free tuition fees. All of these were already in place and supposedly costed according to Swinney. Politics is such a transient phenomenon and whilst the people of Scotland have voted in the SNP to represent them currently in government they have withheld the mandate to allow independence. As the left return to their natural parties the SNP representation will fall further. nothing to do with the “British State”. Everything to do with the Scottish electorate. The Scot Goes Pop author does some good polling analysis, but he uses a blogging site that seems not to allow the blocking of vexatious commentators. PoliticalBetting does similar but with generally better comments and often covers Scottish polls. Yes – its a bit weird that he wont move to another platform? Not been on Bella for a while but intrigued by the renewed 2 handed trolling…….anyone got ideas about this?……a think tank, university lecturer with student acolytes. Why do they bother? What is the motivation? I can see journalists and think tank employees paid to push the free market “world view” and the line that “there is no altenative”……which has been so powerfully effective in the climate change denial industry……. But can anyone think why the people behind these false names are given the paid time to try to subvert such a small operation as Bella? hahahahahaha…top paranoid projecting! true fruitcake mode. I’m just a bloke in his pants eating cheese on toast with one eye on the football nursing a hangover…who also thinks nationalism (any nationalism) isn’t all it’s cracked up to be. It’s as simple as that. Scot nationalism is just part of a wider retreat of people into populism, parochialism, fragmentation and division that is going on all over the place. We’ve been here before folks a number of times and it never ends well. Not sure the international global conspiracy has much use for me, I’m too grumpy and argumentative. I do hope your wearing Union Jack pants and eating British Cheddar cheese! There are more than a few loon balls on here eh? Ploughmans or Branston…now there’s a debate of real importance! Just don’t mention french mustard. Ever think you might be a teensy bit paranoid? I dip in here occasionally because there’s often an interesting point of view from the other side, as opposed to the mentally ill screechings of Wings Over Bath. But I don’t get paid for it. Thankfully a majority of us are against nationalism naturally, no incentive required. If you look at the history of pseudo names on here pushing the same line and often acting as two handers and making repeated references to Hayek, one could be forgiven for being suspicious without being paranoid. But I am glad you can’t abide nationalism…….same here……Royal Family, British militarism, punching above our weight, British exceptionalism, living in the past (Zulu or Dambusters on the telly every Boxing Day in the 21st Century, a Foreign Secretary who wants to refloat Britannia)…..hopefully the people who live in Scotland can be collaborative European citizens underpinned by a written Constitution which explicitly commits to a non nuclear and environmentally sustainable future. Good to see RIC organizing another conference. The October 2014 conference attracted 3,000 folks; while the 2013 conference had 1,100 folks and 2012 had 900 folks participating. It will be good to see all aspects of YES get back together. Let’s not be divided or diverted by some suspicious comments. Best to ignore. Key words in this article. – “British decline”. It is around, one just needs ti look. UK parties in Scotland, one MP each and in decline. Tories at 20%, hardly resounding despite msm and EBC cheerleading from Pacific Quay. UK military unfit fir purpose, frigates lying idle and aircraft carriers with no planes. Trident folly and the Chinese having to prop up England’s power generation. English and Welsh vote to leave the EU. Post imperial psyche in decline and in crisis. A sense of disorientation dahn sath, xenophobic outpourings from UKIP and its hangers on. The palace of Westminster symbolically crumbling and increase in jingoistic Britishness/Englishness programmes all extolling “great”! Ugh!!! Rampant militarism and the outdrawn poppy trails up and down the country. Finally, the Westminster regime has put its position among the rest of the world on the outside looking in. No seat at the EU and being informed by Australia and the US ( special relation!!) to be at the back of the queue. The EU comes first is the message. You are just a wee island on the periphery!! Then the final illusion. Fallon, minister of war, threatens the EU that the UK will veto any proposed EU forces while the British state is still a member!! Ha ha!! The British state is de facto “out”. Paper tiger indeed, Sir Michael Fallon! How to make friends when you want to negotiate as an outsider a possible new relationship with the 27 EU members!! Finally, there is the UK annual deficit, not to mention the long term deficit in trillions! The so-called Scottish deficit is a part of the British state deficit, which the London government covers through borrowing. They do not subsidise Scotland; their macro-mismanagement of the economy, their follies – Trident and other wasteful projects and warring has been out of kilter with the realities of the crumbling Westminster decline. This time, the US will not come to the aid of the British state. Read the tunes and plot the downturn in the British state’s situation in the world. Akin to the position of the Habsburg empire 100 years ago. Very telling post! Historians will look back at exactly this point to see the closure on Britain’s decline which surprisingly teetered on after Suez. – one evident in some of the sad responses that are seeking to maintain a status quo that doesn’t exist since it is rapidly being destroyed by its own destructive logic – to be replaced by the insanity of Trump and co, or by people who care about others. We either reclaim our common world or it will continue to be destroyed. It’s fascinating that for all the money and trolling and billions that the fossil fuel lobby have to pour into misinformation, the majority in America now understand that climate change is real because they see it happening to them. Likewise the majority no longer accept the current state of Britain – and want to rush to UKIP or Corbyn (down south) or to Independence here. However, in amongst the the daily drip drip drip of status quo deception, it is hard to see that there is a positive alternative. Perhaps it will take another period of focused truth-telling (by Women for Indy, Bella, Wings, Scot goes Pop, Peat Worrier, Bateman, etc, but most of all by each of us going street by street, conversation by conversation, something RIC contributed to hugely last time) to raise the current 47% for Yes to 60% just as we moved from 30% to 45% last time. Nothing changes until we get moving, then everything changes. I have been to several RIC events and always come away from them feeling disappointed. There’s just far too many speakers in my opinion all of them touting a similar line which leaves hardly enough space for discussion and education. I’m not convinced either that RIC increased turnout in the referendum as it’s supporters claim. For example, RIC claims they increased turnout in poor areas yet in poor areas where RIC didn’t canvass the turnout was also high. The timing of this event is also wrong as I can’t see a referendum this side of the 2020s. Sturgeons’ too cautious a politician to go for an early referendum – and with sluggish polling and a weak economy she would be foolish to call indy ref 2 any soon. The No voters who voted Yes to remain in the EU will be taken out with Brexit!! The Yes voters who voted to leave the EU must still vote for independence, or else they are stuck in the UK Union and Westminster dominates. The EU union is not the incorporating UK union in which Scotland does not exist! Get real, Scots. You do not count in the UK in the eyes of the HoC and the HoL. The unionist mps from Scotland are not even lobby fodder anymore for Labour or the Tories. They must count along with he LibDem MP as cringe worthy to their English betters. Three yoons from Scotland at Westminster! You could not make it up!! Easy on the exclamation marks, Braveheart.